Now in its fourth year, the unique one-day event has to date engaged with over 11,000 school children from across Devon. Held at Exeter’s Westpoint Arena, Farmwise is a collaboration between Devon County Council, its tenant farmers and NPS, with the aim of educating children about farms and farm produce. This year, around 1400 pupils took part in hands on activities in 12 different zones to learn about where their food comes from. Workshops covered how to make butter and cheese, demonstrations on how to look after farm animals, and learning about fruits, seeds and composting. 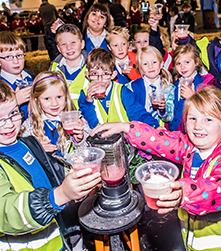 Alison Reid, Farmwise Event Coordinator at NPS South West, said: “It is really important for NPS to be involved with Farmwise, and to give school children across Devon the opportunity to learn about farming. “We manage Devon County Council’s farms estates together with providing other private sector landlords, tenants and owner occupiers with rural professional advice. It is vital that we educate our children about the importance of sustainable sources of food to support the future of farming in our county.